What it feels like when the world goes cold and dark. David Appell is a contributor to Writers on the Range, the opinion service of High Country News. He is freelance writer living in Salem, Oregon. I’ve seen three things in my life that didn’t look real — the Grand Canyon, Crater Lake in Oregon and the Aug. 21 total solar eclipse. Of the three, the eclipse that I saw from Salem, Oregon, is the least describable. It was as if the world suddenly turned into a giant dream, where all rules were instantly turned off and I realized I was someplace I’d never been before. I can’t remember now exactly what I expected to see. But I do know my mental image was backward. I stupidly pictured myself in the park near my house looking westward, toward Oregon’s coast. Of course, I know the sun rises in the East, but my imagination had it backwards because I knew the eclipse’s shadow would start at the Pacific coast and then speed eastward over the continental United States. Still, this eclipse was nothing like I could have expected. I don’t think I’m capable — or anyone is capable — of imagining totality in any realistic way, unless they’d seen a total eclipse before. It’s a relatively simple astronomical event to grasp, the moon getting between Earth and the sun and casting a shadow over Earth, but the actuality is so much more. About 20 minutes before totality, all of us standing in a park noticed the day getting darker. It was subtle at first, and it wasn’t so much the sky as the grass and trees morphing to a muted shade of green. As the black disc advanced, the yellow sliver of the sun became ever thinner. The last few minutes before totality were especially exciting, as the moon’s black disc came close to blocking out the sun. Wonder of wonders, we realized, it was actually happening. Then when totality struck, the darkness seemed to come out of nowhere. The sky seemed to shut down, to give up and quit before its time. The darkness wasn’t complete, but more like a night under a full moon. We took our eclipse glasses off as the sun went to black except for its flaring corona. For the two minutes of totality, I was aware of nothing else going on in the world, of anything else even existing. 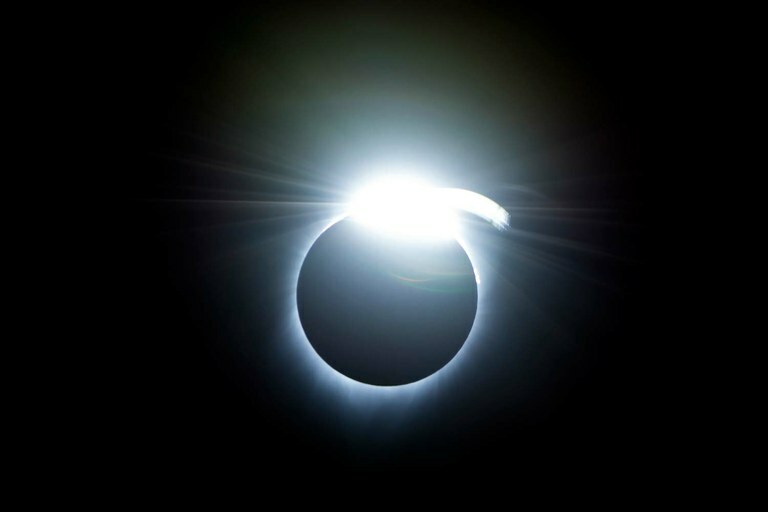 The “diamond-ring” effect occurs at the beginning and end of totality during a total solar eclipse. And then, at the end of two minutes, the diamond ring burst from the sky — and every one of some 300 people gathered in the park erupted in loud cheers and whooping. It was almost a physical release. The ring only lasted two to three seconds, but it was the most brilliant, glorious sight of all. Then normal life returned, as of course it had to, and at once I understood why this experience was unique. The last 30 seconds when the sun’s obscuration was 98 to 99 percent were nothing like totality because the sun is still just too bright to look at. At totality everything suddenly changed: The world collapsed. I understood why the ancients might have thought the world was ending. Ten minutes after totality we were already on our phones to see where the 2024 eclipse will cross the United States. It will cut a swath from Texas up through the Ohio valley over Cleveland, Ohio, and Buffalo, New York. This recent experience was so stunning that I plan to travel to its path of totality. Here in Salem, we were lucky. The day could not have been more perfect — a crystal-clear blue sky with not even a single cloud. The fresh sense of morning still hung in the air. It all perfectly came together when the moon stopped the sun. My sister wept. I got goose bumps. I didn’t think of my small place in the big universe; I didn’t feel humbled by it all, and I didn’t think of the glory of science predicting the phenomenon to the very second. I fell into the experience with no preconceptions whatsoever. It simply took me over. For some precious seconds I was not the center of the world, but I was part of the universe. I — whatever I am — was calm and somehow free. It still feels like a gift packaged as dream. But even better.